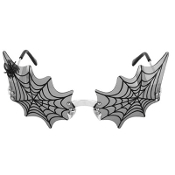 Any evil sorcereress of the night would be bewitchingly wicked in these spider web glasses complete with a little dimensional spider decoration. These high quality costume glasses fit adults and kids ages 14 and up. Join your immortal undead friends for a stroll through the cemetery with these punk goth-style web-shaped lense sunglasses. Feature SMOKE GRAY tinted UV400 rimless lenses. - Made by *elope, inc. (*elope is known for their high quality and imaginative products.